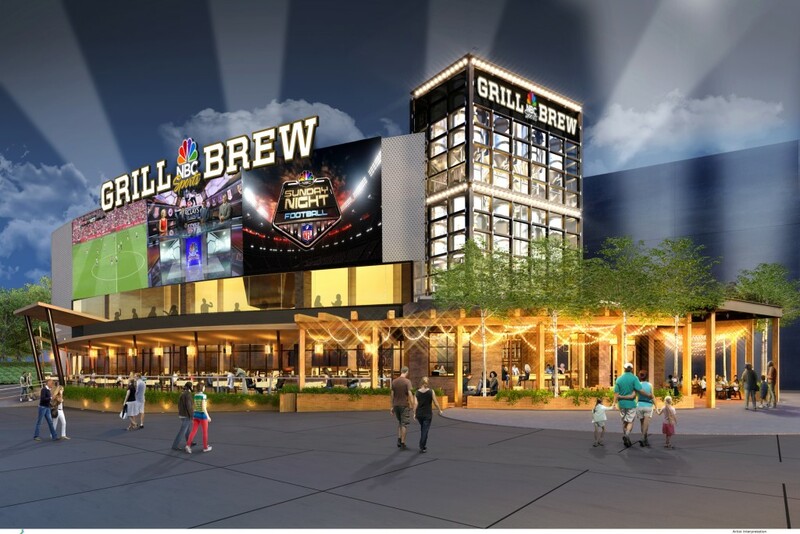 NBC Sports Grill & Brew Coming to Universal CityWalk! Many have been wondering what was happening to the old NASCAR restaurant at Universal CityWalk. Well, wonder no more, as Universal has announced the coming of the first NBC Sports Grill & Brew! The world’s first-ever NBC Sports Grill & Brew is coming to Universal CityWalk – bringing an entirely new level of sports-dining experience. Opening this fall, the all-new restaurant is designed to reflect the excellence and excitement of NBC Sports’ award-winning coverage. A massive HD stadium screen more than 100-feet wide will tower over guests as they enter the restaurant. Searchlights will span the sky. And then – as guests enter – the real MVP experience will begin. Food will be prepared on open kettle grills set where everyone can watch the action. And every fan will have the best seat in the house thanks to nearly 100 HD TV screens that will be playing a constant stream of live sports content and in-depth sports coverage. And no sports dining experience is complete without the perfect beer. NBC Sports Grill & Brew features more than 100 unique selections, ranging from craft beers to regional brews to an exclusive draft you can only find at the restaurant. NBC Sports Grill & Brew continues the epic growth at Universal CityWalk. The entertainment complex recently underwent a historic expansion that included the opening of eight new venues in just one year. The two-tiered, 30-acre complex features a collection of themed restaurants, shops and nightclubs, including The Cowfish, VIVO Italian Kitchen, Emeril’s Restaurant Orlando, Jimmy Buffett’s Margaritaville, Antojitos Authentic Mexican Food and Rising Star. Check out the video, below, then tell us in the comments which game you’d most like to watch at NBC Sports Grill & Brew when it opens.